Digital systems design requires rigorous modeling and simulation analysis that eliminates design risks and potential harm to users. 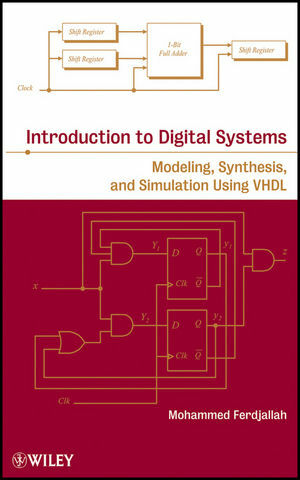 Introduction to Digital Systems: Modeling, Synthesis, and Simulation Using VHDL introduces the application of modeling and synthesis in the effective design of digital systems and explains applicable analytical and computational methods. Through step-by-step explanations and numerous examples, the author equips readers with the tools needed to model, synthesize, and simulate digital principles using Very High Speed Integrated Circuit Hardware Description Language (VHDL) programming. Each chapter begins with learning objectives that outline key concepts that follow, and all discussions conclude with problem sets that allow readers to test their comprehension of the presented material. Throughout the book, VHDL sample codes are used to illustrate circuit design, providing guidance not only on how to learn and master VHDL programming, but also how to model and simulate digital circuits. Introduction to Digital Systems is an excellent book for courses in modeling and simulation, operations research, engineering, and computer science at the upper-undergraduate and graduate levels. The book also serves as a valuable resource for researchers and practitioners in the fields of operations research, mathematical modeling, simulation, electrical engineering, and computer science. Mohammed Ferdjallah, PhD, is Research Associate Professor in the Virginia Modeling, Analysis, and Simulation Center at Old Dominion University. A Senior Member of IEEE, he has published numerous journal articles in his areas of research interest, including Internet-based embedded systems, time-varying identification system analysis, wireless and remote biomedical sensor design, and embedded and reconfigurable systems. 1 Digital System Modeling and Simulation. 1.2 Modeling, Synthesis, and Simulation Design. 1.3 History of Digital Systems. 1.7 Simple Programmable Logic Devices. 1.8 Complex Programmable Logic Devices. 1.10 Future of Digital Systems. 2.2 Bases and Number Systems. 2.5 Signed and Unsigned Numbers. 2.7 Addition of Signed Numbers. 3 Boolean Algebra and Logic. 3.3 Logic Variables and Logic Functions. 3.4 Boolean Axioms and Theorems. 3.5 Basic Logic Gates and Truth Tables. 3.6 Logic Representations and Circuit Design. 3.13 NAND and NOR Equivalent Circuit Design. 3.14 Standard Logic Integrated Circuits. 4.2 CAD Tool–Based Logic Design. 4.9 VHDL Signal and Generate Statements. 4.11 Loops and Decision-Making Statements. 5.4 NMOS and PMOS Logic Gates. 5.7 Practical Aspects of Logic Gates. 6.2 Logic Function Optimization Process. 6.8 XOR and NXOR Karnaugh Maps. 7.4 Logic Design with Multiplexers. 9.3 Finite-State Machine Design Concepts.